This is part of mixdown window. 1. I can not select path that I want. Because there is no full path, I don’t know which is what I have to choose. 2. 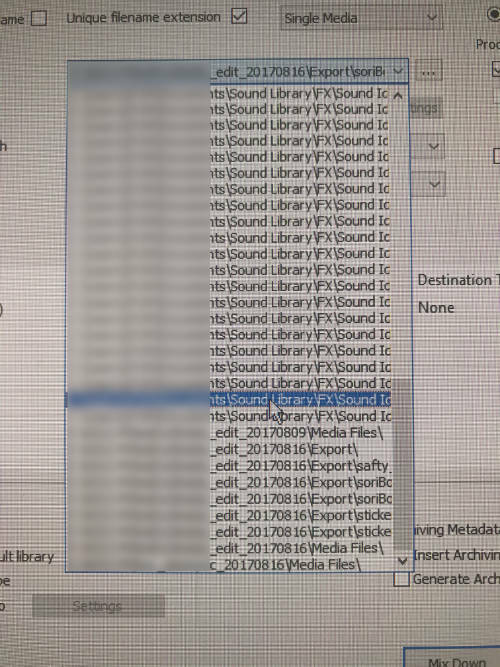 When using Pyramix with Global library(Sound FX), there are large number of folder mounted (automatically). In most cases I do not mixdown to mounted folder contained sound library. Is there any way to get rid of mounted library folder list? 1. No. Old bug. Has been there for far too long. Argued about this years (7) ago. Nothing done. Still "waiting" to be implemented. My guess: will never be done. Why else wait for 7 years? Workaround: hover the mouse until windows displays the full pathname. Ridiculous I know, but that how we have been doing this for years. 2. Yes. You can get rid of the mounted library by simply unmounting them from the media management window. You cannot get rid of the search result window either. Cant even close it, for the next results will be zero. Old bug too. I have to use very short folder name. It might be wise to assemble a list of long requested bug fixes or missing basic functionality (like new file while in record). And rank them for importance. I, too, get frustrated with new features that only Big Audio will use, while some very basic UI everyday issues persist. Don't get me wrong, I love using PMX, but some basic UI problems make life difficult or unnecessarily slow. I consider myself Big Audio too, and most companies that own Pyramix-systems all fall into that same category. The distinction is not one of size, but of money spend. That is not the same, but it defines the focus of the company. Should we be happy that PMX is now compatible with China? Obviously yes! Yes, by Big Audio I mean organisations doing 22.2 NHK, big sports broadcasters, eurovision, museums, stadium and concert PA sound etc. Immersive is a dirty word.